A silverware spoiler: People used to hate the fork. When first introduced in Italy, and then in France and England, it did not go over well. And we're not talking about the kind of eh, I'm-not-going-to-use-that-weird-thing kind of dislike; we're talking straight TOOL OF THE DEVIL abhorrence. The whole history of the fork started off pretty benign—at least from what we can tell. The Greeks used a fork-like tool to keep their kill from twisting around while they carved it. The thing had two spears extending toward the table that secured meat and then slid easily from the flesh. A similarly styled instrument also popped up in royal courts in the Middle East in the 7th century, but this time it was used for actual eating. Because the fork was straight from handle to tine, picking up food required a stab and lift motion. Something like peas were absolutely out of the question, but we'll get to that later. The fork drama really started when a Byzantine-born princess married the doge of Venice in 1005. She ate with a set of golden forks she brought with her, and the Italians were not pleased. "Food was a gift from God, and to use an artificial means of conveying it to the mouth implied that this heavenly gift was unfit to be touched by human hands," explains the book Feeding Desire. The plague caught up with her shortly thereafter, and Venice clergymen claimed her use of the two-pronged (horned!) utensil of vanity prompted the punishment from God. This tool-of-the-devil branding effectively buried the flatware. 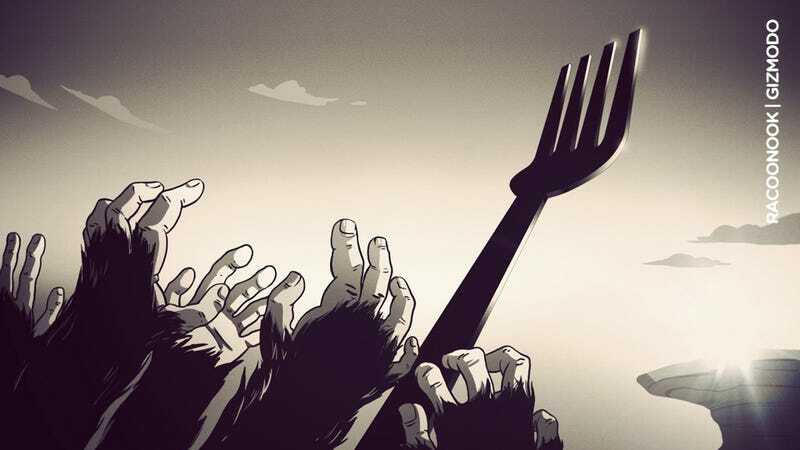 "The fork was fraught with such negative meaning when first introduced in Europe that it didn't resurface for several centuries," says Darra Goldstein, Editor-in-Chief of the food and culture journal Gastronomica. But by the 1500s, Italians finally got behind what looked like a straight, small, pointy tuning fork. Forward-thinking travelers brought the innovative implement back to France and England, but instead of excitement over a clean-handed future, the fork was met with much skepticism. The French thought that, at just a few inches in length, it was too effeminate to use. And the English, like the early Italians, felt that God had deemed it unnecessary. Luckily, in the war with affectation and the Almighty, the fork won. By the mid-1600s, wealthy Brits had deemed the fork fashionable, and included the third utensil on their table. At first forks were crafted out of whatever materials were locally available like iron or bronze. But because the fork was an indication of status, moneyed citizens shelled out for mouth-shovels with bling. Materials like mother of pearl, amber, and jade were introduced. But even though forks got fancier, they weren't actually any better at picking up grub. It was food fashion that eventually shaped a better fork. In the 17th century, peas (seriously) were all the rage among the French nobility. But eating them was tricky. Imagine how hard it would be to swallow a plate-full using metal toothpicks attached to a fancy stick. You couldn't scoop the peas up because there was a wide food-swallowing hole between the fork's two tines. And spearing was obviously time consuming. So the tech evolved. Silversmiths closed the gap by adding an extra tine or two in the middle. They also made the whole instrument bigger and pushed the plate-hitting part upwards, allowing the spears to now scoop as well as stab. Et voilà! A fork fit for food. But it wasn't until commercial electroplating began in 1840 with the discovery of cyanide solutions that the not so humble fork hit the masses. Solid silver was much more expensive than something just plated with it. Before then, most simply couldn't afford access to the utensil. By the 20th century, fork design started swinging the way of utility and ergonomics over decoration. (Ornate handles just weren't comfortable in the hand.) Danish silversmith Georg Jensen, who focused on function instead of frills, popularized streamlined silverware. Stainless steel also appeared in the flatware game, which didn't require the same kind of elbow grease to keep sparkly. Without the time, attention, and status, the fork became a common object. Centuries of tweaks have landed the fork squarely in the category of things we don't even think about-a measure of a truly successful design. Rachel Swaby is a freelance writer living in San Francisco. Check her out on Twitter. Andres Rivera/Racoonook is a Brooklyn-based Designer illustrator. His website is raccoonnook.com, and you can follow him on Twitter, too.